Just a few days before Christmas and Disney’s release of “Into the Woods” comes a special meet-up event! 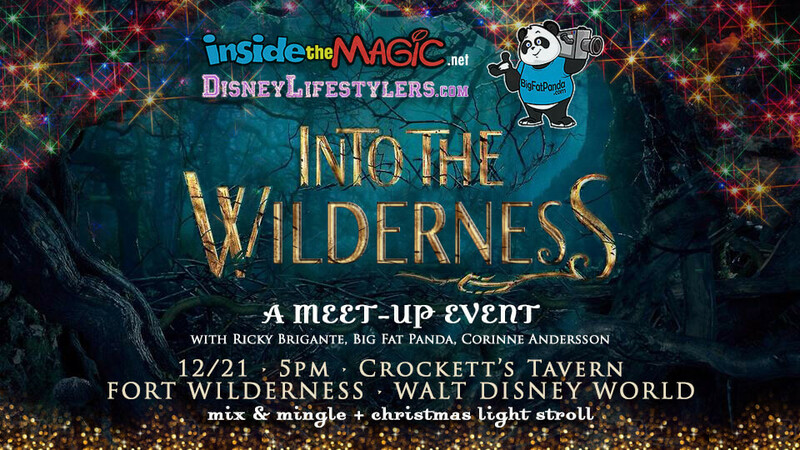 Come mix and mingle with Inside the Magic’s Ricky Brigante, Panda of BigFatPanda.com and Corinne Andersson of DisneyLifestylers.com (and our own merchandise expert on the Inside the Merch blog. To attend, simply show up at Crockett’s Tavern, located near Pioneer Hall. Plan ahead to get there, as you’ll likely need to hop a bus over from the main parking lot. Crockett’s Tavern does serve food and drinks (here’s the menu) but indulging isn’t required. Just come ready to socialize! And, after an hour or so as it gets dark, we’ll head outside to stroll around and look at all the campsites decked out for the holidays. It’s a casual event, just in time for Christmas! See you there.